Last week's Blogger meltdown has really made a mess of my little blog. I haven't been able to post anything till today, have lost posts, some even look like a four year old put them together but I will give it the old college try and salvage what I can. If you are a follower and found that I have disappeared off of your blog list, I apologize for the inconvenience of having to re-follow, not sure why my follower's list has disappeared but hopefully everything will get back to normal soon! 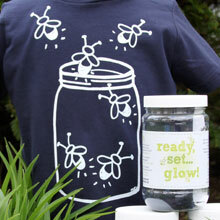 Since there is not a whole lot we can do about them, why not enjoy the summertime company of the firefly and entertain your little ones with this adorable t-shirt and firefly observing kit from MyPerennial. I came across it last week and instantly fell in love! I was reminded of my own summers as a kid back in the stone ages, when DSi's, Wii's and iPod's were still a glimmer in some techie nerd's eye and kids played outdoors enjoying nature, and the warm sunshine on their faces. The kit comes with the t-shirt, an unbreakable jar, magnifying glass and a little tip sheet on finding the best bugs to light up your jar and your children's faces! Can you think of a better way to spend a summer evening enjoying nature and your kiddo's company?? Click on the link above or here to be taken to MyPerennial's site! Yeah, Blogger was giving me fits last week, too. It would have been nice for users to receive feedback from Google Blogger, but I guess that won't be happening! Anyhoo, LOVE the fire fly T-shirt and kit. 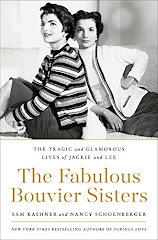 This would be perfect for my kids - will visit the site today!